Friday March 24th 1893 It had turned colder and was snowing a little this morning. I was busy all morning getting a load ready to send over. I went over after dinner and partly put down the carpet in the front room. Hattie was at work over home. It was supper time when I went over and I met her coming this way. Father's birthday. Saturday March 25th 1893 Will took over another load this morning and I walked over. Hattie came across the river as soon as we got the waggon loaded again. I put down the carpet in Josie's room and finished the one I began yesterday before dinner. In the afternoon they brought over a load om my things and took back two of Hatties. I got Mr Hatfields room so he could go into it and it was seven oclock before I got supper. Josie came over here about six oclock and Mary went over there. Fanny was nearly sick tonight and we were all utterly tired out. 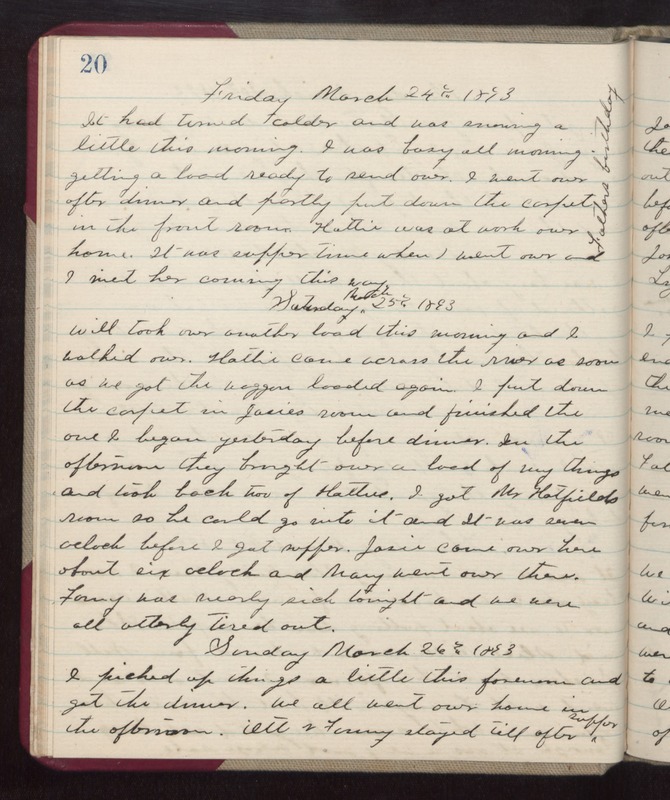 Sunday March 26th 1893 I picked up things a little this forenoon and got the dinner. We all went over home in the afternoon. Ott & Fanny stayed till after supper.